Enterprise Europe Network and major SME associations. nir-vana is a working tool which facilitates the follow up of my clients' projects and actions, and report in an IPR protected area. It manages proactively both – my leads and my clients. I obtain access to new partners, search and knowledge providers and learn constantly. On nir-vana I find the right innovation advisor and other companies for realization. It is a safe area to talk about my idea and innovation and I get helpful support I need during the entire process. I am not longer alone with my innovation and with nir-vana my innovation becomes alive. Create your own profile and become visible to potential clients, companies, experts and advisors. Publish an innovation challenge, collaboration profile or post your success cases. Create awareness for your innovation, your expertise or business and get discovered for future business. nir-vana is the only platform integrating seamless "search and find" to the next stage of collaborating. Get connected with experts and companies for partnering. Find trusted innovation advisors, certified by Enterprise Europe Network and build up your team of partners, companies and experts you need for your innovation. nir-vana accelerate your network opportunities by metasearch with the relevant international network platforms linknovate, openisme, EEN and Presans. Discover potential funding opportunities for your innovation. On nir-vana you have access to national and EU funding programmes, public funding and private investors. Get connected to consultants and advisors specialised on funding and grant preparation. 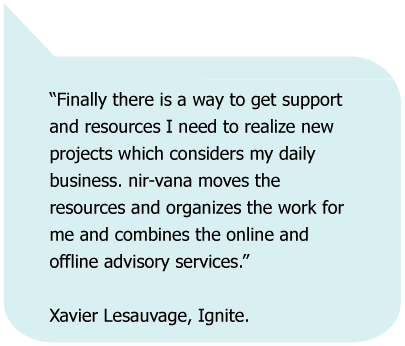 nir-vana provides you with expert knowledge and key insights relevant for your business. Get advice on markets, patents and IP. You found the ideal partner or team. Now start your collaboration. nir-vana provides you a trusted and secured working environment through the entire innovation process. A collaboration space with a guided and defined workflow, where communication and documents are shared in one single trusted place. 2020 research and innovation programme under grant agreement No 681787.